With a heatwave hitting Britain this week and temperatures in the 30s, being at work isn’t always easy. Unlike home where we can relax and keep cool a little more easily, keeping our core body temperatures down isn’t simple when we’re surrounded by other people, walking from place to place, driving to appointments or dealing with day to day work pressures. With the option of working from home or more flexibly to avoid the hottest part of the day not a realistic option for many, it’s wise for employers to make the work environment as comfortable as possible. Overheated employees will find it harder to work, get more headaches and are likely to be less engaged. People need to drink between 2.5 and 3.5 litres of water a day when it’s hot and that’s just relatively sedentary workers. 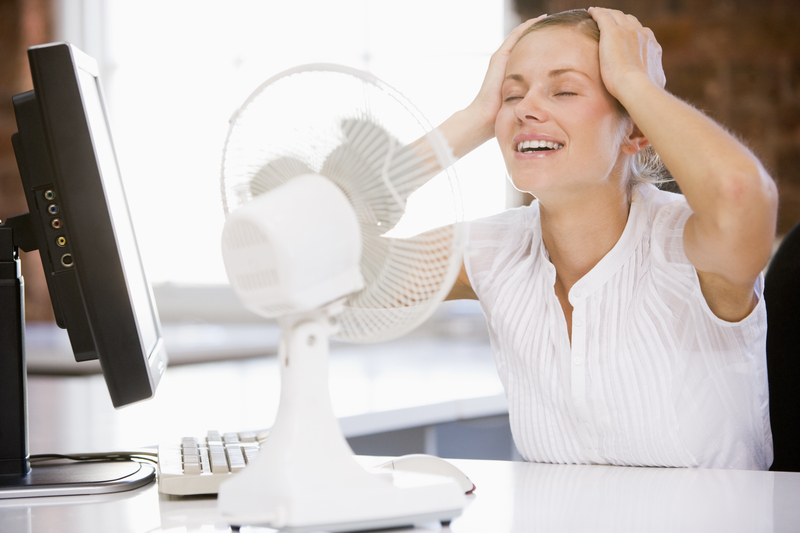 The loss of body fluids from sweating can lead to headaches, disorientation and at worst heatstroke. Buying in bottles of water, whether or not you have water coolers on site, could be a wise investment as these can be given out to anyone travelling to meetings and likely to be in a hot car for much of the day, on hand for people to drink in lengthy meetings and in the office fridge for everyone. Cans of drink can also be useful as these can be used for cooling wrists before they are opened. Cold, non caffeinated drinks are often advised rather than tea and coffee when it’s very hot as caffeine is a diuretic which encourages the loss of body fluids. Large fans at the side of every room can help to keep a flow of cooler air circulating around. Positioning these in the right places can make a big difference. One recommendation is to open the windows and place one standing fan next to an open window facing into the room. Another fan should then be placed next to another, facing out of the window, where it can blow out the air that has travelled across the room from the other fan. If space and furniture layout will allow try placing a bucket of ice in front of the fan blowing into the room as this will cool the air down even more. Keep the fan blades positioned to point down rather than upwards as this sends the cooler air to a sitting level rather than the ceiling. 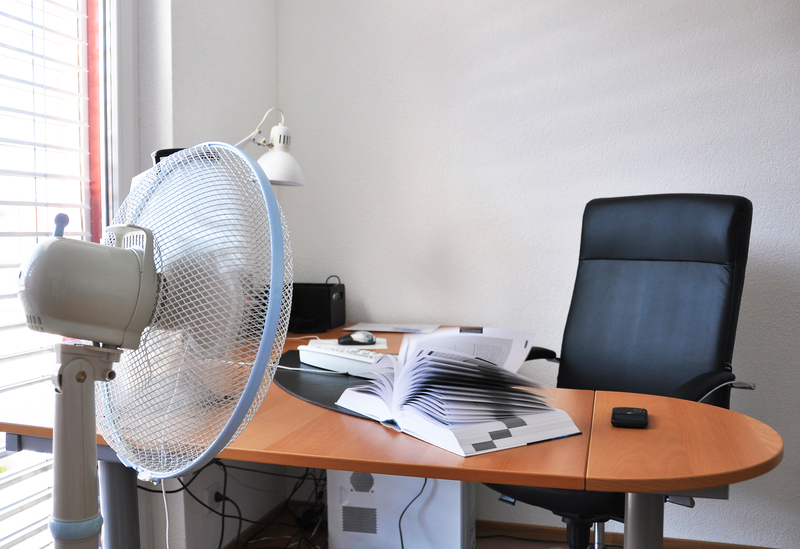 Because people often feel the heat in different ways, with some struggling more than others to manage their temperatures, it’s worth giving employees better control of their immediate environment with their own desk fans. For people sitting next to an open window it could be worth putting the fan on the windowsill pointing onto the desk. This is because fans generate their own heat and this will help drive any heat out of the window rather than onto a colleague’s desk or into the room. Try placing a cup of ice in front of the blades as this will lower the temperature of the air being blown out. 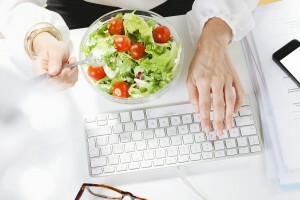 If you provide catering for employees think about ordering lighter snacks and vegetable, fruit and fish based products, as these are easier to digest. Heavier, high fat and high protein meals take longer to digest and will raise people’s body temperatures. 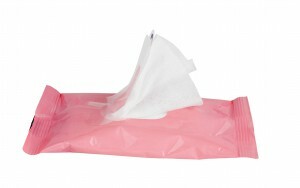 Think about keeping a stock of personal care items in washrooms that will help people to freshen up, prevent and treat sunburn. Products that could put a smile on people’s faces and make their day much easier include suncream sachets, burn gel, lip balms and refreshing wipes. Posted 9:59 am by Darren Phillips & filed under Facilities Supplies.